Why am writing about this shiny freebie then? Because the mostly Hawaiian people that built, manage, and run Trump Waikiki have more than earned your consideration. Having stayed there myself, I can independently verify that the several thousand favorable guest ratings are in no way “FAKE NEWS.” Their reported experiences closely mirror mine. For example, some luxury restaurants or hotels can make you feel out of place, either due to how you’re dressed, the unimpressive rental car you pull up in, or maybe even the color of your skin. At Trump Waikiki, I watched hotel staff extend the Aloha spirit to everyone they interacted with—not just a journalist they were hoping to impressive. And certainly not just people that looked rich. They did so with children guests, the many Japanese guests, a young Korean couple splurging on their honeymoon, a middle-class looking family from Tennessee, a couple with thick Indian accents. Everyone received smile-inducing leis upon arrival. Everyone was treated like a very important person. Before arriving at the property, I admit I unfairly judged the book by its figurative cover. Would there be protests outside, I wondered. Would the hotel be empty? Would sleeveless rednecks drinking “Natty Light,” waving confederate flags, and shouting “‘Murica!” dominate the lobby? As it usually is, the reality of life is very different from our often unfounded, emotionally charged, and sometimes narrow-minded thinking. In this case, the reality of the staff, the decor, the considerate amenities, and the idyllic surroundings were downright delightful. 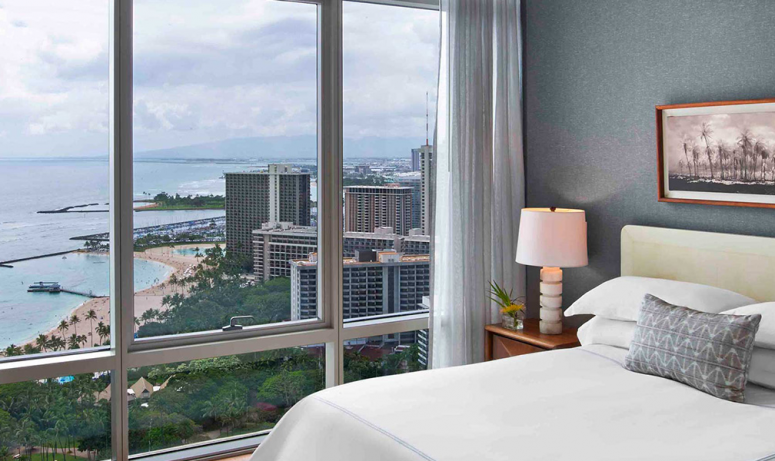 It could be said that for rooms starting at $350-450 per night, “They better be.” But in my experience, Trump Waikiki goes beyond that. Even a competing publicist from a different property said the same to me.